John de Vere Loder was born in London on 5 February 1895, the only son of Conservative MP Gerald Loder and Lady Louise de Vere Beauclerk and the daughter of the 10th Duke of St Albans. He was educated at Eton College. He intended to go to Trinity College, Cambridge but at the outbreak of the WW1 he was instead commissioned into the 4th Battalion of the Royal Sussex Regiment. He later joined the Intelligence Corps where he served throughout the war in Gallipoli, Egypt and Palestine. He was Mentioned in Dispatches and left the British Army in 1919 with the rank of Captain. Loder worked as a clerk in the Foreign Office from 1919 to 1922 and then for two years at the League of Nations in Geneva. He was elected the Conservative Member of Parliament for Leicester East in 1924, a seat he held until defeated in the 1929 General Election. Two years later, he returned to the House of Commons as member for Lewes. He succeeded his father as second Baron Wakehurst in 1936. In 1937 Wakehurst was appointed Governor of New South Wales. In the same year he was made KCMG. He was to be the last non-Australian governor of the State. In August 1939 he successfully handled a major political crisis involving the replacement of the government following a motion of no confidence in Parliament. The Wakehursts involved themselves in helping the war effort following Australia's entry into the Second World War, giving regular speeches and rallying people to contribute towards the war effort. 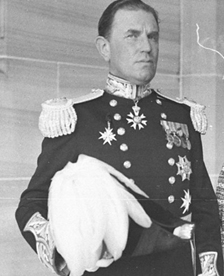 Wakehurst's appointment ended on 8 January 1946, then the longest term for a New South Wales Governor, and returned to England, marking the end of 158 years of British Governors in New South Wales. Upon returning to Britain, Lord and Lady Wakehurst worked with community organisations including the Order of St John of Jerusalem and for the English-Speaking Union. He was a trustee of the Royal Opera House, Covent Garden and a governor of the Royal Ballet. Lord Wakehurst succeeded Earl Granville as the Governor of Northern Ireland in 1952. In May 1962, Queen Elizabeth II appointed him as a Knight of the Order of the Garter (KG). Reappointed for a second term in 1958, Wakehurst retired from office in 1964 and died on 30 October 1970 at his home at Chelsea, London.